Chuck at the helm waving to the camera. Distance racing is a different type of sailboat racing. It takes patience, able to perform while tired, lots of analyzing weather, and yes just sailing the boat. Over the last 15 years I have done many distance races, in fact I sail more miles a year than I drive my car. I did not strive to be a distance racer, distance racing found me. I had done a small amount of 100-200 mile long races and then was asked to do a 1000 mile, San Diego to Puerto Vallarta Yacht Race. The race went well and someone from that crew suggested me to another boat doing a distance race. Then things snowballed and now I do most every ocean race on the West Coast of the US and Mexico. I have done many of the Puerto Vallarta races over time, a thousand mile race from San Diego in the Spring to the tropical city of Puerto Vallarta on boats from 35′ to 73′. Some years it is a windy race where you feel you are just hanging on and others are slow and you wonder whether you will get there in time to make your flight home. Almost always this race is down wind and down swell and in great weather. The latter is what keeps people coming back every two years. 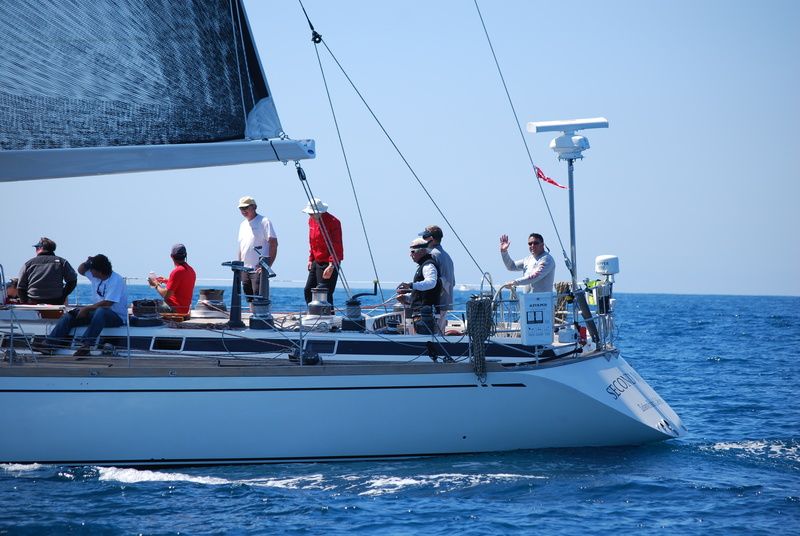 This year I sailed aboard the Swan 651 Second Wind owned by John Chamberlain and Dean Fargo. They are planning to do the 2015 Transpac and have just completed a complete refit of the boat including a new carbon rig. Not wanting to follow in the footsteps of many large Traspac racers, they want to do it in extreme comfort and class the way a Swan was meant to be sailed. John is a gourmet cook and part of the perpetration for the Transpac was to test provisioning and cooking these foods under way. For most of the crew this was the first real distance race. Some had not done a lot of sailing in general before stepping foot on this boat last year. Two of the crew were high school students that were sons of two of the crew.We started the 2014 Puerto Vallarta Race on Friday March 14th under blue skies and warm temperatures with 10 knots of wind to get out of San Diego Bay and into the ocean. The wind held through the first night and into the second day. The moon was full and skies clear which make for perfect sailing conditions. As the days rolled on the crew got into the groove of the 4 hours on and 4 hours off around the clock. John had amazing food including fresh baked muffins in the mornings. Our midnight snacks were over the top, one night it was Hawaiian meatballs, kept warm in a crock pot. Did I mention showers anytime you wanted? On almost all of my offshore races there are squid that end up on the decks at night and in the morning you make a patrol around the boat and get rid of them before they sit in the sun and start to smell. I told the crew about this and there were doubters. As with all sure things not one squid was on the deck and I heard about it for days.With the exception of a couple light air spots we had medium air sailing and great weather. As we approached finish on the 6th day some of the crew were expressing their sadness that it was coming to an end. This was quickly recanted when with 15 miles to go the wind completely shut off just after we traded gybes with one of the Santa Cruz 70’s in the race. It was looking like we were going to spend another night out on the course when we were within sight and ear shot of Puerto Vallarta. A few hours later a small breeze came in and we were able to leave the two 70’s sitting in place while we sailed to the finish. After finishing we were received by the San Diego Yacht Club with cold beer. This is a huge bonus for most boats, we in fact still had wine and plenty of cold beer. The routing software had us finishing within a few hours of our actual time. When we hit the dock and met with the Port Captain it was 4:30am and we were told to return at 9:30am to clear customs. We checked into our hotel for a few hours and sleep on solid ground. Sailing this race on a large Swan was a completely different experience than most of my offshore racing where we eat dehydrated food and sleep in pipe births while the boat makes screaming noises and rocks you around like a rag doll. It was a great experience for all of us and we look forward to the 2015 Transpac. Chuck works at Ullman Sails San Diego. If you have any questions about sails or racing to Baja, he’s the man to talk to. Experienced offshore racer and several National, Regional and North American champion in several classes from International 14's to Maxi Boats. Santander 2014: What’s The Big Deal?